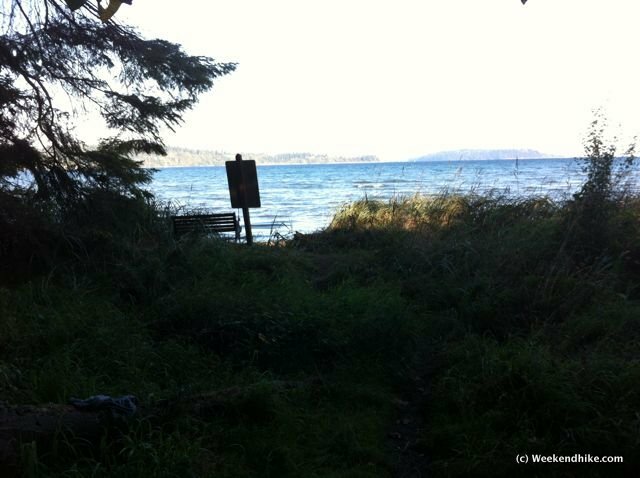 This is one of the best hikes on Vashon Island. Its easy to access, well maintained, fairly straight-forward and takes you from Mid-island down to Puget Sound at Fern Cove. It can get popular but it is less crowded during weekdays and non-summer weekends. 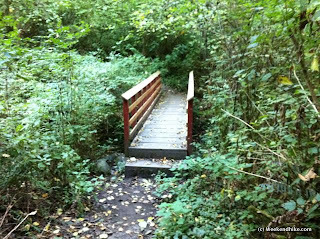 You wont find this hike in popular Seattle hiking guide books, but is briefly described in the Island's local hiking book which you can get on Vashon. As with many Vashon hikes, directions to the hike sound a bit vague - but in reality its quite easy to find. 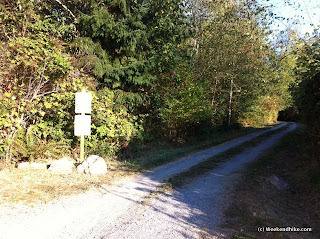 The access road to trailhead is on SW 156th Street, across the street from Vashon Winery. 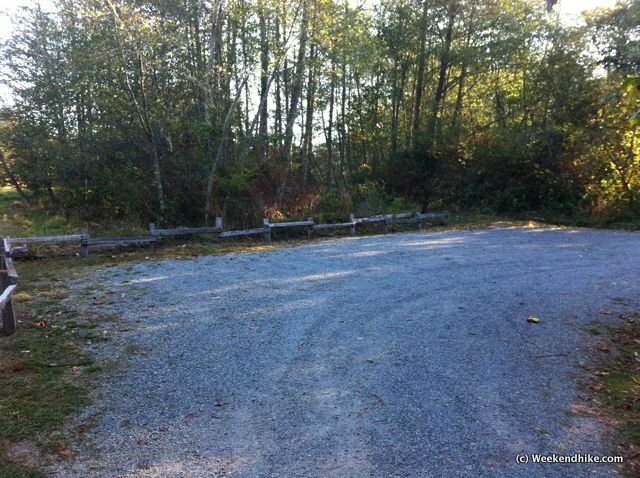 There are about 5-6 spaces for cars in the trailhead parking lot. 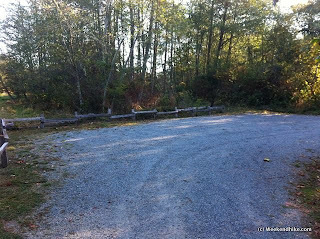 If the trailhead lot is full, you can park at the Park and Ride Lot at the Epsicopal Church on Vashon Highway. The trailhead is well marked and there are no real intersections along the route - so its a hike that is easy to navigate. The hike starts off with a gentle stroll through a field and shortly enters the forest to the West. The trail follows the top of a high ridge but then quickly (and steeply) descends into the creek area. 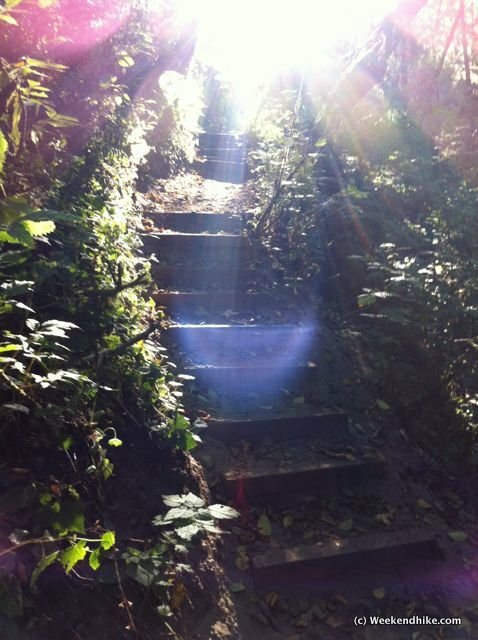 There are some wooden steps, but there are also some steep dirt patches. This would probably not be very fun during a rainy/wet day. After the steep descend, you reach the first creek bridge. 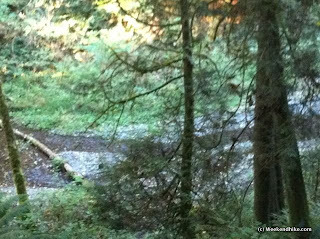 From here, the trail climbs back up the hill and passes another couple creeks - one with a foot bridge, two more without. 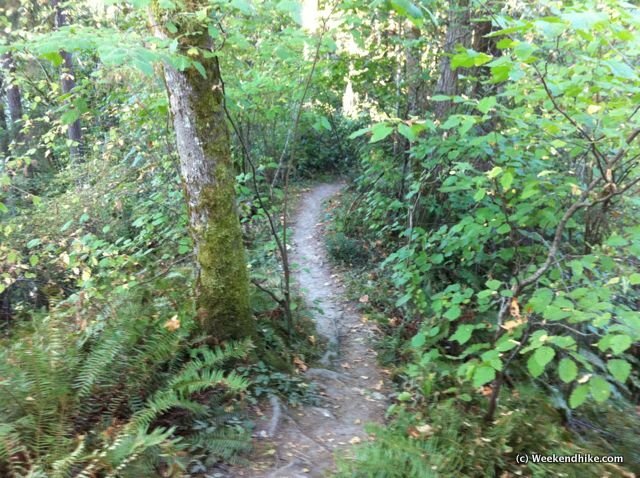 The trail is mostly a single track, but is fairly well maintained. 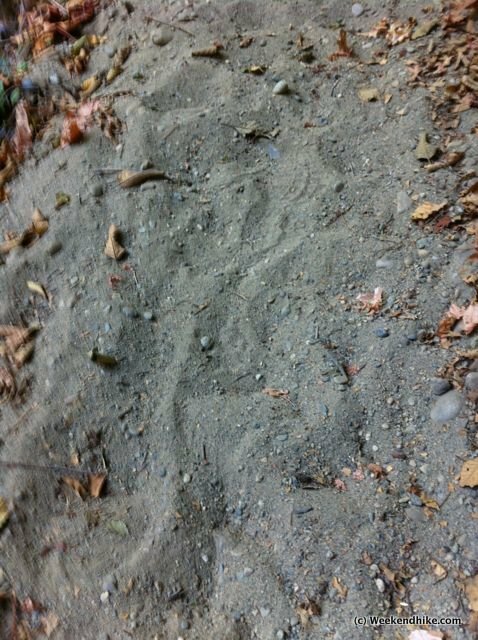 There are some loose dirt/sandy sections which again might be a bit sloppy on a rainy day. The midsection of the trail is fairly easy downhill. From high above you will see Shingle Mill Creek below. As you approach Cedarhurst Road, you will see a Y in the trail, just continue to your right along the main trail. 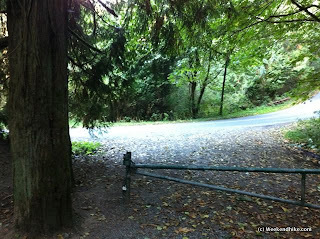 As you pass the gate, you will see a very small opening on the otherside of the road. After carefully crossing Cedarhurst Road (Caution - this is a bit of a blind curve for drivers), continue on that trail across the road. 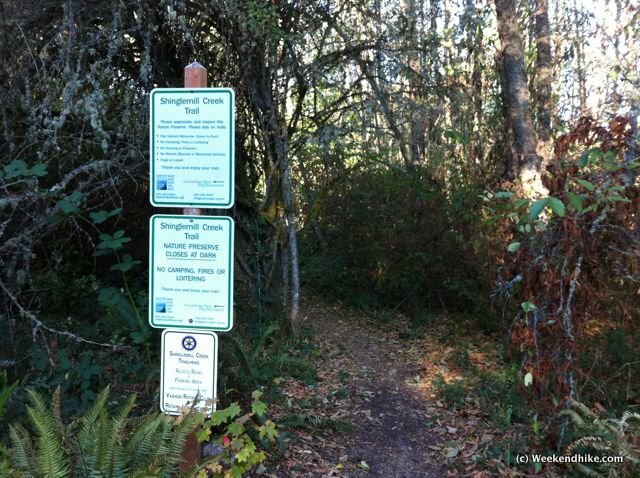 The lower section of this trail does not allow dogs as its truely part of the Fern Cove Nature preserve. Its a gentle trail that follows the creek and opens up to a bench on the Fern Cove beach area. Its a great place to have some water and food. Be sure to take time to enjoy this world class view as the return hike is all uphill. I didnt want to spoil the view for those yet to do this hike - but trust me its pretty good. The uphill return is fairly easy until you reach the steep beginning section of the hike. This final section will get your heart going and is probably not enjoyable for those with "creeky" knees. At the time of day I did this section the sun was in my eyes as I navigated the steps. This is a very satisfying Vashon hike - it is a little over 3 miles rounds trip (long for Vashon) and has a great payoff by ending at Fern Cove. 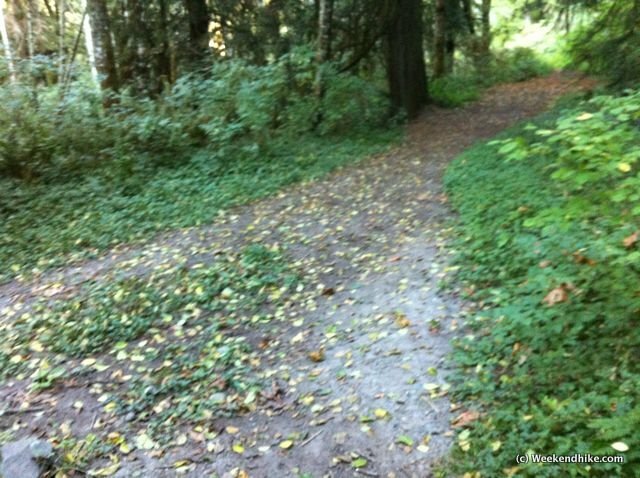 You could do this as a one-way hike (leave from Vashon Winery and end at Fern Cove) but it would require a car-drop off near Fern Cove. As an added bonus if you do the full round-trip on a summer weekend you can enjoy some Vashon Wine after your hike. 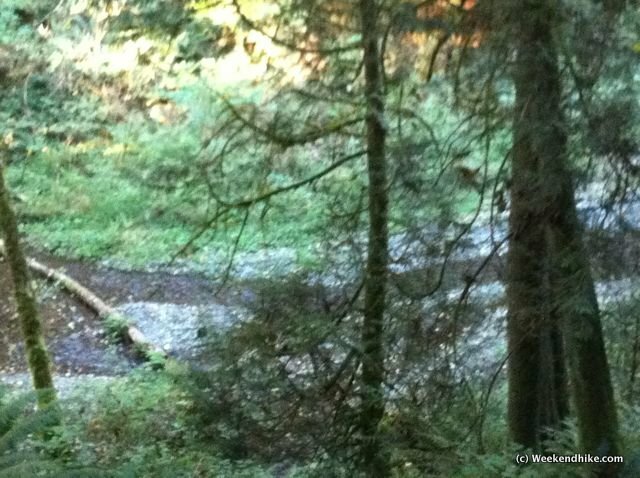 The Trail is manged by the Vashon Land Trust and was mostly built by Vashon Rotary, a local Boy Scout troop, a Student Conservation Association crew and other volunteers. Other Info - Limited parking at the trailhead parking lot - use the nearby Park and Ride lot if needed. No real street parking available. haven't been to vashon in awhile, didn't know there were trails out there! lovely trail and you can get wine at the end.